These days I hear the words “customer engagement” ,“involvement”, “word of mouth” increasingly in the context of social media. The sheer number of people joining the social networks is making even traditional marketers to think of a strategy to “engage” their customer in the most novel ways possible through social media. But what creates engagement? Many psychology pundits believe, it has to be essentially a powerful “story”. Without a compelling story, our ideas are dead on arrival. Stories change beliefs. Jonathan Gottschall, in his book The Storytelling Animalsays that story is the most powerful means of communicating a message. We are a species addicted to stories. How “engaging” a story one can tell, determines one’s persuasive power and hence determines the space in the minds of consumer. So, as traditional media is gearing up to tell the most engaging story to their audience, it is imperative we ask questions on how best to utilize social media for powerful Storytelling. 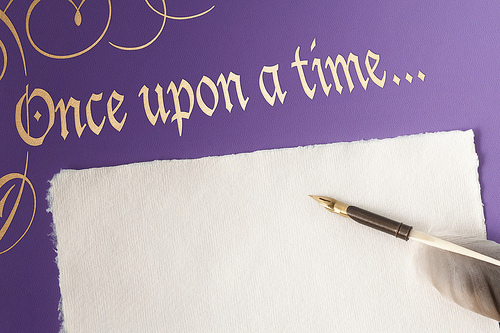 Why will Storytelling on social media be effective? Since the advent of social media over the last decade, we have come across various user communities, which are collections of loyalists, users who are committed, conscientious, passionate and also very intelligent. There is an intrinsic connection between members of these communities in spite of geographical boundaries, which any marketer can utilize to establish an iconic brand. To elevate a brand beyond its utilitarian role, a marketer needs to create an identity myth, involve multiple storytellers through these communities on social networks and thus weave powerful brand stories that touch the lives of consumers. What are the possible challenges in Storytelling on Social Media? Psychologists argue that the power of a story lies in its emotional appeal that lets us drop our intellectual guard, which otherwise is expressed strongly if we are presented with plain factual arguments. However, on social media, since user communities are typically very intelligent and therefore more critical and sceptical, tackling this aspect of storytelling might be difficult. So while we may find users unable to detect “false notes” in an absorbing story on a film screen, that might not be the case with the audience on social media. The challenge is to not replace all the logic and reason,and still be able to tell an emotionally engaging story, not just facts. With decreasing character limits and limited attention spans amidst rapidly generated content on the digital media, it is increasingly becoming essential to be as economical in expression as possible. Traditionally, stories are best told when one engages with all the characters and their emotions and their respective plots in detail, which may take a lot of time to unfold. So the challenge is to tell the story like an epic, in parts & chapters, focussing on the relevant parts, while continuously engaging the audience within the attention spans they are likely to exhibit. The best part about telling a story on social media is that it is possible to go into the details for those who are looking for them. The challenge is to customize the story as per the depth of engagement of one’s audience base. Users of social media are an enlightened lot. If they are intelligent and critical, they are also willing to plug the loopholes in one’s story by assuming the role of the storyteller. Their responses stem from this assumption of what would the shape of the story be, had they been telling it. So, in the world of social media, the story doesn’t necessarily originate from the marketers or the storytellers, it grows organically as it passes along a web of users and may grow indefinitely till it reaches its natural end. This way, one is also able to empower the audience to co-create. The challenge is how not to define the boundaries of one’s brand story and letting it flow like a river while also drawing all the necessary minerals along the way. Many such challenges will need to be studied as we understand the power of social media in times to come and storytelling will have to evolve as this media evolves. One of the best examples of how storytelling has been facilitated in social media recently is Facebook’s Timeline. The “story of your life”, as Facebook calls it, is an effective way to tell an individual or a brand story. For example, it is possible to add content back in time by creating milestones on Timeline and tell the world about your beginnings, a basic premise-setting for any storyteller. But just posting something on Timeline may not work, until it is also leveraged to generate interactivity and more importantly “conversations”, essential driver for any social medium. 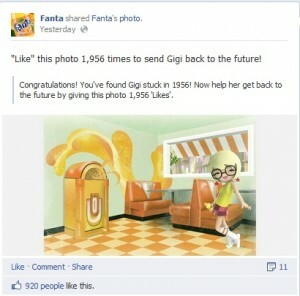 And a good example of engaging the customers through Timeline has to be Fanta’s page on Facebook. On February 29, 2012, Fanta posted a status update saying that the leap year day had disturbed the “Fanta time”. Because of this, four Fanta characters: Gigi, Lola, Floyd and Tristan had been brought into the past and hidden in the timeline. Users were given the clues to identify the year each of the characters was in, and then had to ‘like’ their images the same number of times as the year to bring them back to the present. Next to the images of the characters that people should like, they had placed images that showed historical stories from the Fanta brand, which they made people aware of. Storytelling for brand-building is beginning to gain ground for marketers across the world and it will be foolish to assume that as human beings, we are different from other species through the power to reason, because we are beasts of emotion more than logic and we all are creatures of story. The “social-ness” of social media too stems from the fact we need conversations more than we need textbooks, we need communities so that we can engage in “human” activities of common interests and share our experiences as “stories” that build our future. A film buff & an aspiring scriptwriter/writer, Mudit is a Mechanical Engineer and a Media Professional, having passed out of MICA with a post-graduate diploma in Communications Management in 2005. His inclination in films led him to pursuing a Film Appreciation course at FTII, Pune in 2007. Having worked for 7 years with companies like The Times of India, Nimbus TV, Palador Pictures & Star TV, in various functions spanning Consumer Insights, Media Research, Strategic Planning & Marketing he now has embarked upon an enterprise called Storycentre, with emphasis on Storytelling as a means of communication.